Beijing (April 13, 2016) – Today, the International Service for the Acquisition of Agri-Biotech Applications (ISAAA) released its annual report detailing the adoption of biotech crops, “20th Anniversary of the Global Commercialization of Biotech Crops (1996-2015) and Biotech Crop Highlights in 2015,” showcasing the global increase in biotech hectarage from 1.7 million hectares in 1996 to 179.7 million hectares in 2015. This 100-fold increase in just 20 years makes biotechnology the fastest adopted crop technology in recent times, reflecting farmer satisfaction with biotech crops. Since 1996, 2 billon hectares of arable land – a massive area more than twice the landmass of China or the United States – have been planted with biotech crops. Additionally, it is estimated that farmers in up to 28 countries have reaped more than US$150 billion in benefits from biotech crops since 1996. This has helped alleviate poverty for up to 16.5 million small farmers and their families annually totaling about 65 million people, who are some of the poorest people in the world. “More farmers are planting biotech crops in developing countries precisely because biotech crops are a rigorously-tested option for improving crop yields,” said Clive James, founder and emeritus chair of ISAAA, who has authored the ISAAA report for the past two decades. “Despite claims from opponents that biotechnology only benefits farmers in industrialized countries, the continued adoption of the technology in developing countries disproves that” James added. For the fourth consecutive year, developing countries planted more biotech crops (14.5 million hectares) than industrialized countries. In 2015, Latin American, Asian and African farmers grew biotech crops on 54 percent of global biotech hectarage (97.1 million hectares of 179.7 million biotech hectares) and of the 28 countries that planted biotech crops, 20 were developing nations. Annually, up to 18 million farmers, 90 percent of whom were small, resource-poor growers in developing countries, benefited from planting biotech crops from 1996 to 2015. “China is just one example of biotechnology’s benefits for farmers in developing countries. Between 1997 and 2014, biotech cotton varieties brought an estimated $17.5 billion worth of benefits to Chinese cotton farmers, and they realized $1.3 billion in 2014 alone,” explained ISAAA Global Coordinator, Randy Hautea. Also in 2015, India became the leading cotton producer in the world with much of its growth attributed to biotech Bt cotton. India is the largest biotech cotton country in the world with 11.6 million hectares planted in 2015 by 7.7 million small farmers. In 2014 and 2015, an impressive 95 percent of India’s cotton crop was planted with biotech seed; China’s adoption in 2015 was 96 percent. 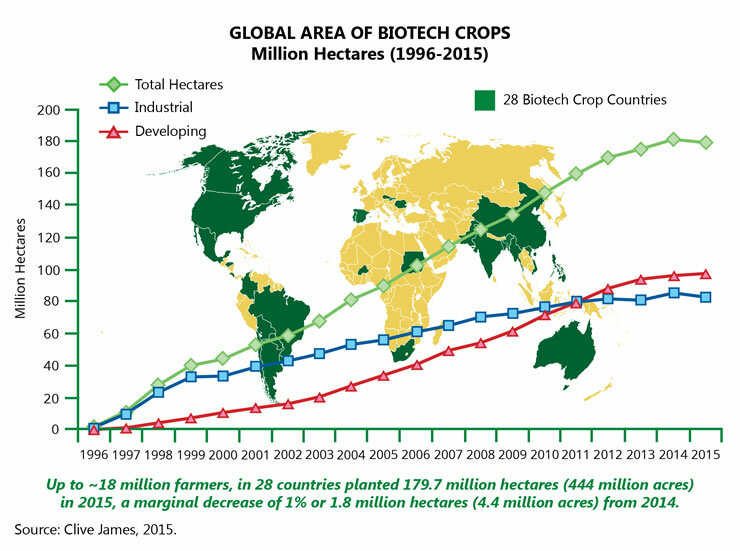 Following a remarkable run of 19 years of consecutive growth from 1996 to 2014, with 12 years of double-digit growth, the global hectarage of biotech crops peaked at 181.5 million hectares in 2014, compared with 179.7 million hectares in 2015, equivalent to a net marginal decrease of 1 percent. This change is principally due to an overall decrease in total crop hectarage, associated with low prices for commodity crops in 2015. ISAAA anticipates that total crop hectarage will increase when crop prices improve. For example, Canada has projected that canola hectarage in 2016 will revert to the higher level of 2014. Other factors affecting biotech hectarage in 2015 include the devastating drought in South Africa, which led to a massive 23 percent decrease of 700,000 hectares in intended plantings in 2015. The drought in eastern and southern Africa in 2015/2016 puts up to 15 to 20 million poor people at risk for food insecurity and compels South Africa, usually a maize exporter, to rely on maize imports. New biotech crops were approved and/or commercialized in several countries including the United States, Brazil, Argentina, Canada and Myanmar. Innate™ Generation 1 potatoes, with lower levels of acrylamide, a potential carcinogen, and resistance to bruising. InnateTM Generation 2, approved in 2015, also has late blight resistance. It is noteworthy that the potato is the fourth most important food crop in the world. Arctic® Apples that do not brown when sliced. The first non-transgenic genome-edited crop to be commercialized globally, SU Canola™, was planted in the United States. The first-time approval of a GM animal food product, GM salmon, for human consumption. Biotech crops with multiple traits, often called “stacked traits,” were planted on 58.5 million hectares, representing 33 percent of all biotech hectares planted and a 14 percent year-over-year increase. Vietnam planted a stacked-trait biotech Bt and herbicide-tolerant maize as its first biotech crop. Biotech DroughtGard™ maize, first planted in the United States in 2013, increased 15-fold from 50,000 hectares in 2013 to 810,000 hectares reflecting high farmer acceptance. Sudan increased Bt cotton hectarage by 30 percent to 120,000 hectares, while various factors precluded a higher hectarage in Burkina Faso. Eight African countries field-tested, pro-poor, priority African crops, the penultimate step prior to approval. High rates of adoption (90 percent to 100 percent) in current major biotech markets leave little room for expansion. However, there is a significant potential in other “new” countries for selected products, such as biotech maize, which has a potential of approximately 100 million more hectares globally, 60 million hectares in Asia, of which 35 million is in China alone, plus 35 million hectares in Africa. More than 85 potential new products in the pipeline are now being field-tested; including a biotech drought tolerant maize from the WEMA project (Water Efficient Maize for Africa) expected to be released in Africa in 2017, Golden Rice in Asia, and fortified bananas and pest-resistant cowpea in Africa. CRISPR (Clustered Regularly Interspersed Short Palindromic Repeats) a new powerful genome editing technology has significant comparative advantages over conventional and GM crops in four domains: precision, speed, cost and regulation. When combined with other advances in crop sciences, CRISPR could increase crop productivity in a “sustainable intensification” mode on the 1.5 billion hectares of global arable land, and make a vital contribution to global food security. For more information or the executive summary of the report, visit www.isaaa.org.